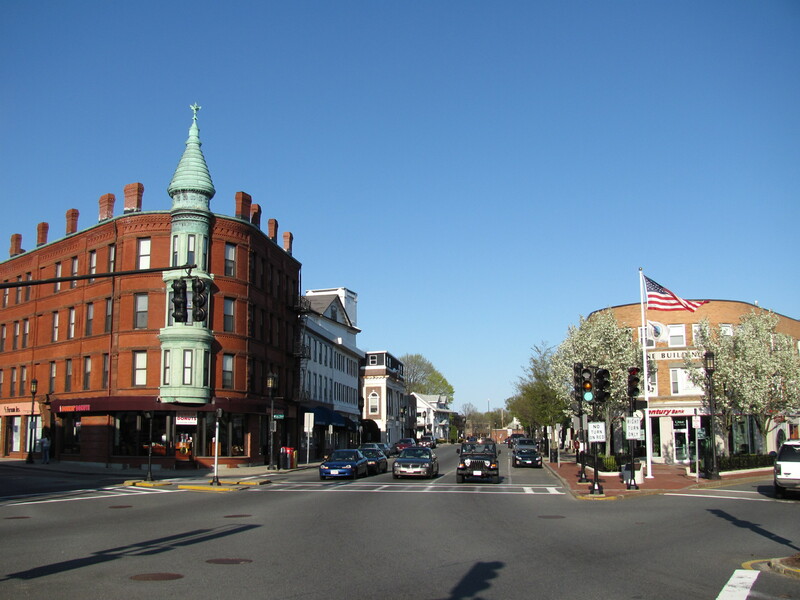 Medford was settled in 1630 as part of Charlestown, when Thomas Dudley referred to it as "Mistick" (a name which persisted for many decades), which his party renamed "Meadford". In 1634, the land north of the Mystic River became the private plantation of former Governor Matthew Cradock; across the river was Ten Hills Farm, which belonged to John Winthrop, Governor of the Massachusetts Bay colony. The name may have come from a description of the "meadow by the ford" in the Mystic River, or from two locations in England that Cradock may have known: the hamlet of Mayford or Metford in Staffordshire near Caverswall, or from the parish of Maidford or Medford (now Towcester, Northamptonshire). George Luther Stearns, an American industrialist and one of John Brown's Secret Six. His passion for the abolitionist cause shaped his life, bringing him into contact with the likes of Abraham Lincoln and Ralph Waldo Emerson and starting The Nation magazine. He was given the rank of major by Massachusetts Governor John Andrew and spent most of the Civil War recruiting for the 54th and 55th Massachusetts regiments and the 5th cavalry. The Peter Tufts House (350 Riverside Ave.) is thought to be the oldest all-brick building in New England. Another important site is the "Slave Wall" on Grove Street, built by "Pomp," a slave owned by the prominent Brooks family. The Isaac Royall House, which once belonged to one of Harvard Law School's founders, Isaac Royall, Jr., is a National Historic Landmark and a local history museum. The house was used by Continental Army troops, including George Washington and John Stark, during the American Revolutionary War. A few crooked officers of the Medford Police and Metropolitan District Commission Police forces pulled off one of the biggest bank robberies and jewel heists in world history in 1980, robbing the Depositors Trust bank over the Memorial Day weekend. The book The Cops Are Robbers: A Convicted Cop's True Story of Police Corruption is based upon this event. Salvatore's Restaurant, located at 55 High Street in Medford Square, is partially in the same location as the bank that was robbed. The private dining room in the restaurant uses the bank's vault door as an entrance way, and the hole in the corner of the ceiling that the robbers crawled through was left intact for nostalgia. An admitted Mob execution by Somerville's Irish Winter Hill Gang of Joe Notarangeli took place at the "Pewter Pot" cafe in Medford Square, now called the "Lighthouse Cafe." In October 1989, the FBI recorded a Mafia initiation ceremony at a home on Guild St. in Medford. Medford is located at 42°25′12″N 71°6′29″W﻿ / ﻿42.42, -71.10806 (42.419996, −71.107942). Irish-Americans are a strong presence in the city and live in all areas. West Medford, the most affluent of Medford's many neighborhoods, was once the bastion of some of Boston's elite families— including Peter Chardon Brooks, one of the wealthiest men in post-colonial America, and father-in-law to Charles Francis Adams — and is also home to an historic African-American neighborhood that dates to the Civil War. As of the census of 2000, there were 55,765 people, 22,067 households, and 13,505 families residing in the city. The population density was 6,851.3 people per square mile (2,645.1/km²). There were 22,687 housing units at an average density of 2,787.3 per square mile (1,076.1/km²). The racial makeup of the city was 86.45% White, 6.10% African American, 0.11% Native American, 3.87% Asian, 0.03% Pacific Islander, 1.14% from other races, and 2.30% from two or more races. Hispanic or Latino of any race were 2.59% of the population. There were 22,067 households out of which 23.6% had children under the age of 18 living with them, 45.6% were married couples living together, 11.8% had a female householder with no husband present, and 38.8% were non-families. 28.7% of all households were made up of individuals and 12.4% had someone living alone who was 65 years of age or older. The average household size was 2.43 and the average family size was 3.04. In the city the population was spread out with 17.9% under the age of 18, 11.0% from 18 to 24, 32.6% from 25 to 44, 21.2% from 45 to 64, and 17.3% who were 65 years of age or older. The median age was 38 years. For every 100 females there were 88.2 males. For every 100 females age 18 and over, there were 85.2 males. Numerous Massachusetts Bay Transportation Authority bus lines go through Medford. On Medford's east side, Wellington station on the Orange Line provides a connection to Boston and the entire rapid transit system. On the west side, the Lowell Commuter Rail Line stops in West Medford Square. ^ a b Bencks, Jarret (2011-10-27). "Cradock Bridge to Be Replaced in 2012 or 2013 - Medford, MA Patch". Medford.patch.com. AOL Inc.. http://medford.patch.com/articles/cradock-bridge-to-be-replaced-in-2012-or-2013. Retrieved 2012-03-20. ^ Gleason, Hall (1937). Old Ships and Ship-Building Days of Medford. Medford, MA: J.C. Miller. p. 76. ^ Forbush, E. H. (1896). The Gypsy Moth. Boston, MA: Wright & Potter. pp. 2–44. ^ "Learning from the Legacy of Leopold Trouvelot" (PDF). Bulletin of the ESA Summer 1989. http://www.sandyliebhold.com/pubs/trouvelot.pdf. Retrieved 2012-09-13. ^ Town, Your (October 12, 2009). "New Michael Bloomberg biography takes a few jabs at Medford". The Boston Globe. http://www.boston.com/yourtown/news/medford/2009/10/a_new_biography_of_new.html. ^ Scott, Helman. "Change on the Mystic". The Boston Globe. http://www.bostonglobe.com/magazine/2013/02/10/west-medford-historically-black-community-crossroads/aiGJYLMNo5TjnJmzSrJ9bK/story.html. Retrieved 15 January 2014. ^ "Medford Transcript". Wicked Local. Perinton, New York: GateHouse Media. http://www.wickedlocal.com/medford. ^ "Newspapers In Medford, MA". Wicked Local. GateHouse Media. http://businesses.wickedlocal.com/9783218/Medford-Daily-Mercury-Medford-MA. ^ "Medford Community Cablevision". Medford Community Cablevision, Inc. http://tv3medford.org. ^ "Medford Cable News". MCN 2011. http://medfordcablenews.com. ^ "Medford Patch". Patch. http://medford.patch.com. ^ "Made In Medford". Comcast's Project Open Voice. Comcast - Argus. http://madeinmedford.com. ^ Nichael M. Grynbaum (2012-03-19). "Mayor’s Ties to Hometown Fade, but for a Few, They Are Still Felt". NY Times. http://www.nytimes.com/2012/03/19/nyregion/bloombergs-hometown-medford-mass-struggles-to-keep-his-attention.html?_r=1. Retrieved 2012-03-20. 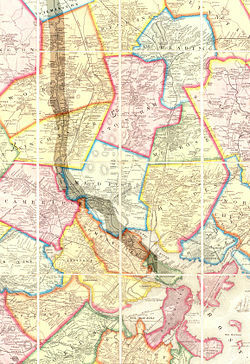 1880 Map of Medford, Bird's Eye View by C.H Brainard. This page uses content from the English language Wikipedia. The original content was at Medford, Massachusetts. The list of authors can be seen in the page history. As with this Familypedia wiki, the content of Wikipedia is available under the Creative Commons License.